What's behind our puzzling fetish to find beauty in numbers? For many mathematicians, what they do is nothing short of creating beauty out of numbers, shapes and forms. In the much quoted words of G H Hardy, the British mathematician who introduced Ramanujan to the western world, “The mathematician’s patterns, like the painter’s or the poet’s, must be beautiful.” Elegant patterns in nature such as the spiral symmetry seen in the sunflower and the nautilus, which apparently mimic a mathematical number called the golden ratio, are often cited to buttress the point. Last month, two Indian physicists Vijay Singh and Praveen Pathak working at the Homi Bhabha Centre for Science Education, Mumbai, wrote a paper in the reputed European Journal of Physics in which they discuss a new encounter with the golden ratio—they show how an evensided geometrical form, say a hexagon, carved out of a similar, but bigger form can be poised on the edge only if the ratio of the sides of the larger to the smaller form is the golden ratio. Simply put, two quantities are in the golden ratio if their ratio is the same as the ratio of their sum to the larger of the two quantities. It’s an irrational number, just like the more popular Pi, with a non-ending and non-repeating value of 1.680339. A few years ago it shot into public limelight following the success of Dan Brown’s The Da Vinci Code and its film adaptation. It belongs to a class of numbers called Pisot-Vijayaraghavan numbers, co-named after the Indian mathematician T Vijayaraghavan. Scientists have regularly explored new dimensions to one of the oldest ideas in mathematics. But the Indian physicists have gone beyond the mathematical ambit to suggest that the crescent moon seen gracing Shiva’s coiffure is an example of the new golden ratio. According to a report in The Times of India, the authors found many allusions to a curved object balancing on the edge in ancient Indian philosophical texts such as the Upanishads, implying that our ancestors were not only aware of the golden ratio, but had deciphered it as a spiritual code. However, such accidental correspondences are not unlike hundreds of other, largely unproven, claims that link this otherwise most fascinating geometrical curiosity to a diverse a set of creations. Like Leonardo Da Vinci’s Mona Lisa, the Great Pyramid of Giza, the marvelous statues of the ancient Greek sculptor Phidias, the music of Debussy and Bartok, and, not to mention, the vital statistics of Scarlett Johansson! Nevertheless, one cannot deny that artists down the ages have been searching for that elusive Platonic proportion that would automatically render all art pleasing or beautiful, and that the golden ratio has been the most enduring candidate. In fact, a few artists and architects in the 20th century, notably the French painter Paul Serusier and the Swiss architect Le Corbusier, have consciously used the golden ratio in their works. Regardless of whether some of the famous works of art reflect a deliberate preference for this proportion, it does raise some interesting questions. If the various reflections of the golden ratio in nature and arts are neither accidental approximations nor just oddball interpretations, then how do we explain their almost ubiquitous imprint? This begs an even more fundamental question: is mathematics inherently beautiful, and if yes, why? 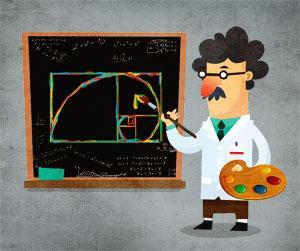 Many scholars and scientists have tried to decode the puzzle of golden ratio, but the jury remains inconclusive. For instance, German psychologist Gustav Fechner suggested an inherent human preference for rectangles based on the golden ratio, but later, more rigorous studies failed to bear out his results. Our fetish for the golden ratio that desperately looks for its lurking existence (shadowy or real) in the world of arts and literature assumes that there is an ideal of beauty and that it could be deployed to create more beauty. However, large numbers of artistic creations refute this dogma of aesthetics.